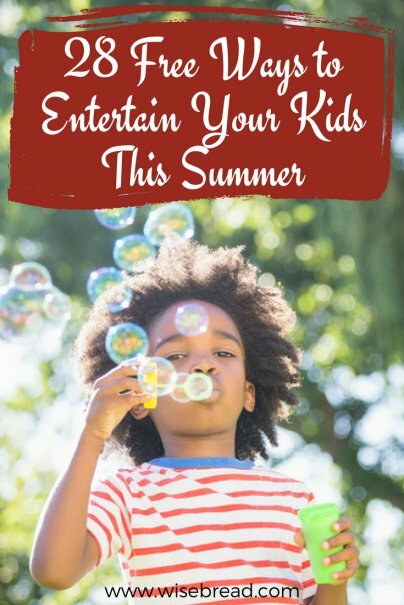 Making memories with your kids this summer doesn't have to drain your bank account. Your children just want to enjoy time together, and there are plenty of ways to do that on a budget. Here are 28 free ways you can have a blast with them. Turn on the sprinklers, have your kids change into swimsuits, and allow them to run wild. You can also add a tarp and some dish soap for a DIY slip and slide. It's really the perfect way to keep cool on a hot summer day. Who needs fancy dress up costumes when Mom and Dad have dresses and suits to throw on? See what funny combos your kids can come up with and even organize a mock fashion show. Hunkering down inside a homemade fort is a fun activity for kids and adults alike. All you need is a few chairs, some sheets or blankets, and a lot of comfy pillows to make the perfect indoor fort. A camping trip won't always fit your schedule or budget, but you can still enjoy the experience by pitching a tent in the backyard. Roast hot dogs and s'mores outdoors with a grill or fire pit, tell ghost stories, and sleep under the stars. And make sure to use bug spray! On a rainy day that can't be spent enjoying the summer sun, stay in and whip up some treats. Scour Pinterest for fun baking recipes to try out. What kid wouldn't want to make unicorn poop cookies or rainbow s'mores dip? Or you can turn a regular meal into a game by letting the kids make funny food art. My girls always love when I turn their pancake breakfast into a dog, cat, or something holiday themed, like a turkey or Santa. Take meal time out in the fresh air with a picnic blanket and paper plates. Enjoy your family picnic at the park, in your backyard, or even in your living room if the weather isn't cooperating. A bath with glow sticks, extra bubbles, or a few drops of food coloring can make tub time a blast. You can even add new toys or bring in water toys for the special occasion. Or you take bath time outside by filling a kiddie pool with bubble bath solution and letting kids get clean in their swimsuits. No need to make your kids sit through a dull science lesson. Get them interested in the subject by trying fun experiments that will blow their minds like making homemade ice cream, rock candy, or creating invisible ink for writing secret messages. When your kids are complaining that they're bored or are fighting with each other, turn up the music and just start dancing. Watch the anger or antsiness fade into endorphins as they enjoy a subtle workout. My kids love going to the pet store just to walk around and look at the animals who've come in with their owners, and the smaller pets like fish that are available for adoption. Some locations have dog and cat adoption days on the weekends, so the kids can meet and pet four-legged friends, too! Clear out the garage, put on your skates, and blast some tunes for a fun DIY roller skating party. If you have a disco light, even better! You can also check out Kids Skate Free to find free skating rink passes in your area. Want your kids to take a break from the screen? Encourage them to make a movie or show of their own. If you don't have a video camera, you can use your smartphone and upload clips to a free movie editor, such as Blender or iMovie, to add special effects and cut and paste scenes. Serve herbal tea, cookies, and tea sandwiches on your fanciest plates and drink with your pinkies up. Talk in accents or listen to a narrated audiobook like the Harry Potter series while you and your kids fancily dine. Bubbles are not just for babies and toddlers. Older kids (and even adults) love them, too! Create giant bubbles with this homemade recipe or reusable bubbles with items you already have on hand. Who doesn't love using a giant heavy ball to knock down several pins at once? Bowling is great for kids and adults, and it doesn't have to cost you a thing. Get free bowling passes through Kids Bowl Free or see if your local bowling alley gives away free games for good grades or birthdays. Invite your children's friends over once a week for a book club meeting and read something that everyone will enjoy. Make themed snacks, crafts, or have the kids re-enact their favorite scenes. Get creative without the mess. Use paint that you have on hand and make masterpieces on paper, rocks, or old shirts. You can even lay down an old bed sheet and let the kids paint with odd objects around the house, like a whisk or straw. Inspire some friendly competition among your family members by holding your own Olympic Games. If you have enough people to split into teams, you can even make your own uniforms with old T-shirts. Try fun games like a three-legged race, carrying an egg on a spoon, and water balloon toss. Give your kids an inside look at people hard at work in various industries. Search FactoryToursUSA under your state to discover free factory tours near you. There are 565 tours listed, and many of them with free or little admission cost. Many stores offer free classes for children. Check with your local library, bookstores, schools, and community center for more offerings. The American Girl Store occasionally offers free events and crafts. Michael's Craft store offers free craft activities along with $2 and $5 craft classes. The LEGO store allows children to complete a free mini-build once a month. HomeDepot does a free workshop for kids each month. It's so important for kids to see where their food comes from, and visiting a local farm is the perfect way to show them. Use LocalHarvest to find nearby farms and free events. You can also connect to pick-your-own farms near your area. Check to see if admission is free and if you can walk and picnic on the farm for free.